A beautiful set of finely carved vintage Chinese terracotta warriors chess set for your retro home. A beautiful, finely carved piece of vintage Chinese terracotta warriors chess set will help set your house’s decor apart from the others. Of size 265mm x 265mm x 60mm and made of elegant fibreboard with leather and polymer resin, each piece of chess measures about 40mm in height, perfect as both a decoration set and a set for actual playing! Price indicated here is for one item. good chess, excellent quality, giving it as a gift. packed well. Chess set was elegant! A reproduced set of antique chess set, perfect for your retro-style coffee table. A vintage hand carved wooden chess set with a stylish wooden hand carved box. 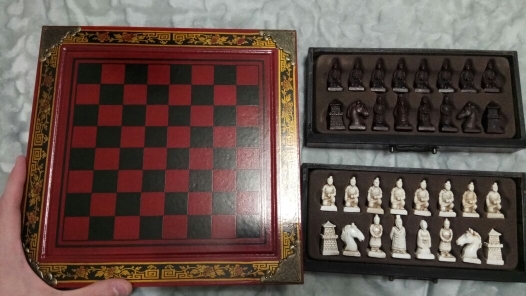 A quaint, vintage Chinese collectible chess set with black and white chess pieces. A vintage hand carved chess set with a folding box to keep you occupied all day long!